I read William Faulkner's The Sound And The Fury as part of an English course taught by one of the most fabulous people I've ever had the pleasure of meeting: Sue Anne Johnson. I took the course in my second semester of college and it turned into one of the best experiences of my life. I'd heard Faulkner's book was difficult, I'd heard it was written as a flow-of-consciousness narrative, but I was still unprepared. As I read the words on the first page I couldn't make them form a narrative. For me it was, as Shakespeare wrote, "full of sound and fury, signifying nothing". The next day Ms. Johnson asked us to raise our hand if we finished our reading assignment. One person had. It got much easier after that first introduction and largely because Sue Anne explained a few things about the viewpoint Faulkner was using in the first part of his book. I won't go into that, but an excellent summary can be found in the Wikipedia entry on The Sound And The Fury. I remember Sue Anne telling us that Falkner wanted shifts in time indicated by a change of ink color but that the cost was prohibitive. 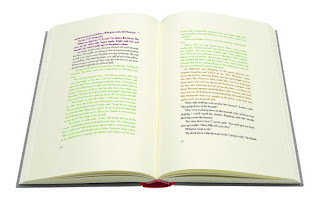 In a special edition, the Folio Society is publishing "The Sound and the Fury" in 14 colors. It's a fine press edition, quarter-bound in leather, with a slipcase and an additional volume of commentary. It also includes a color-coded bookmark that reveals which time period is designated by each color. The Folio Society worked with two Faulkner scholars, Stephen Ross and Noel Polk, to figure out how to divide the text. Only the Benjy section is rendered in the 14 colors of ink. "With the Benjy section the different threads are sufficiently clear that I don't feel we are distorting or compromising the novel," Folio's commissioning editor for limited editions Neil Titman told the Guardian. "I found the book tremendously confusing the first time I read it, so I think that overall you have a net gain here, rather than feeling over-guided." 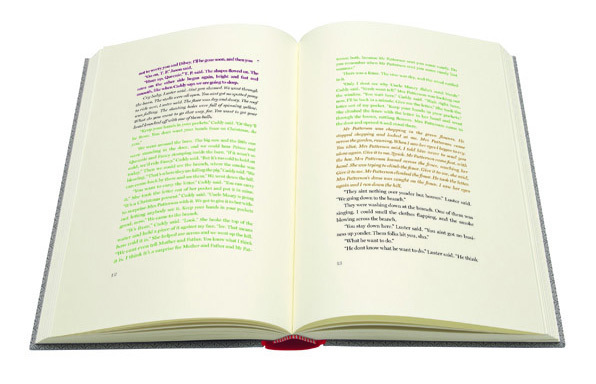 The color edition of Faulkner's "The Sound and the Fury" is being published July 6 in a limited edition of 1,480 and is priced at $345. One thousand preordered copies have been sold. To read the entire article, click here: 'The Sound and the Fury' as William Faulkner imagined, in color. If the colored copy of The Sound And The Fury retails at $345 today I cringe to think what it would have cost a publisher to produce back in 1929! I would love to own one of these versions. Perhaps one day it will be released as an ebook. - How Important Is It To Promote Your Books?